In this chapter you'll learn how to enable, disable and customize these built-in actions. If you want to create your own actions read the How to Define Custom Actions tutorial. When an action is disabled, the backend no longer displays it in any of the views. Moreover, if some user tries to hack the URL to access to a disabled action, they'll see a Forbidden Action error page. The User entity will have both the new and the show actions disabled. The value of the actions option is merged with the default action configuration for each view. In the above example, the edit view of all entities will include the list, delete and show actions (the first two are the default actions and the last one is explicitly configured). The global action configuration (if any) is merged with the entity's action configuration, as explained in the next section. Beware that the actions option just defines if an action should be displayed or not, but it doesn't disable the action (a malicious user could hack the URL and change the action parameter manually). Use the disabled_actions options to ban those actions entirely. name, this is the only mandatory option. You can freely choose this value, but it must be valid as a PHP method name (use characters, numbers and underscores only). label, is the text displayed in the button or link associated with the action. If not defined, the action label is the humanized version of its name option. Set it to null or an empty string to hide it and only display the associated icon. title, is the text used in the title HTML attribute of the <a> element associated with the action. Most of the times you can safely ignore this option, but it's useful to display a helpful message when the action hides its label and only displays its icon. css_class, is the CSS class or classes applied to the link or button used to render the action. icon, is the name of the FontAwesome icon displayed next to the link or inside the button used to render the action. You don't have to include the fa- prefix of the icon name (e.g. to display the icon of a user, don't use fa fa-user or fa-user; just use user). target, is the value of the target HTML attribute applied to the button or link associated with the action (e.g. _blank to open the action in a new browser tab/window). In complex backends it's common to display lots of fields on each list row. In those cases it's recommended to display the actions in a dropdown menu instead of the expanded design used by default. Batch actions are the actions which are applied to multiple items at the same time. 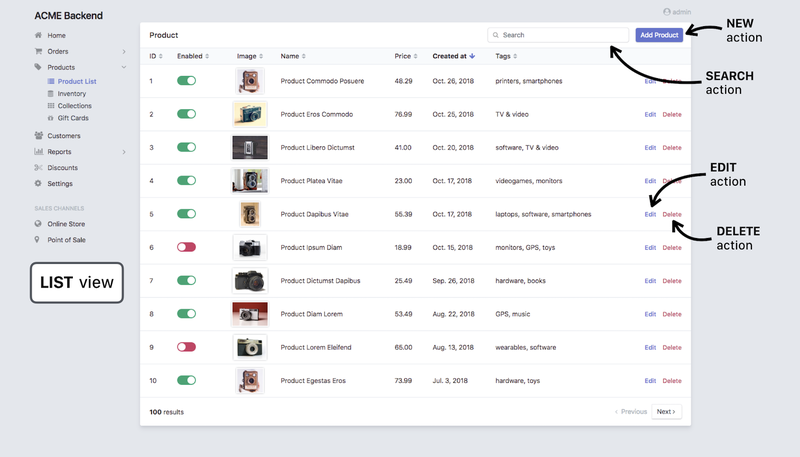 They are only available in the views that display more than one item: list and search. Batch actions are configured the same as regular actions, so you can change their label, icon and title as explained in the previous sections. The merging of global and local config is also done in the same way and the config of disabled_actions is applied to these batch actions too. Read how to create your own batch actions to get the most out of this feature.